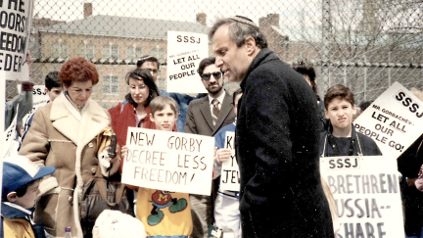 Please join Producer/Director Phil Schneider for a screening of the documentary RIGHTEOUS REBEL: RABBI AVI WEISS on Saturday, January 12th at 7:30pm. Doors open 7:15pm. Seating is limited, so advance registration is strongly suggested. Please register using the form below. Your sponsorship donation is greatly appreciated. In this documentary, filmmaker Phil Schneider provides a compelling and insightful comprehensive look into our own Rav Avi's extraordinary life, and how, as a result of his crusading activism and "speaking truth to power," he has inspired others to "show up, stand up, and speak up" in times of crisis. RIGHTEOUS REBEL also explores the softer side of Rabbi Weiss and his relentless commitment to create an environment of inclusion for his community (known as "the Bayit (i.e. home)" where all are treated with equal respect and dignity. fight inequity taking place anywhere. As Rav Avi himself says when quoting the legendary Jewish leader, Hillel, "If Not Now, When?" We recommend a donation of $10 per person, but all donations are gratefully accepted.